Never Too Young: By Request is a great way to sample the wide-ranging repertoire of the first Catholic hymnal for middle schoolers. Finally, a Catholic music resource made for middle-schoolers! Offering more than 280 contemporary songs for use in prayer, liturgy and the classroom, Never Too Young is just right for children in grades 4-8. All songs have been carefully selected to fit their particular voices, musical skills and catechetical needs. A principal means of catechesis in the past, music is still one of the best ways to teach the faith. The songs in Never Too Young are challenging enough musically to engross your students -- and promote learning. They support a wide range of catechetical topics, from sacraments and Scripture to justice and morality. Use them in faith formation, catechesis, music classes, Liturgy of the Word with children, middle school youth ministry, retreats and more. 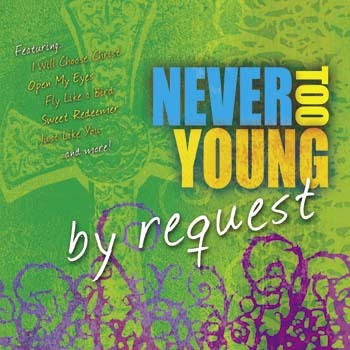 This is the MP3 playlist for Never Too Young: By Request. Offering more than 280 contemporary songs for use in prayer, liturgy and the classroom, Never Too Young is just right for children in grades four through eight. All songs have been carefully selected to fit their particular voices, musical skills and catechetical needs. A principal means of catechesis in the past, music is still one of the best ways to teach faith. The songs in Never Too Young are challenging enough musically to engross your students—and promote learning. Featuring 28 songs, Never Too Young: By Request offers music by the best-known composers of contemporary and children’s music in the Church today, including Steve Angrisano, Tom Booth, Mark Friedman, Sarah Hart, Jesse Manibusan, Janet Vogt and Christopher Walker. With songs in a variety of contemporary styles, including pop, rock and gospel, this resource is a great way to sample the wide-ranging repertoire of the first Catholic hymnal for middle schoolers.